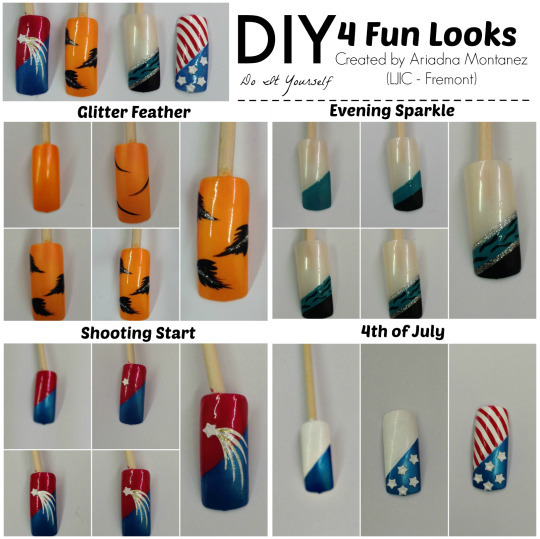 DIY : 4 FUN LOOKS FOR THE SEASON! 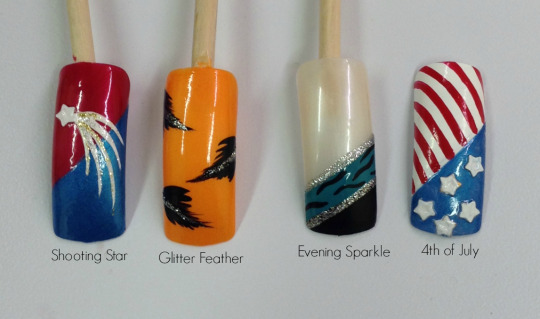 Looking for a new design for your nails? Give one of these fun looks a try! 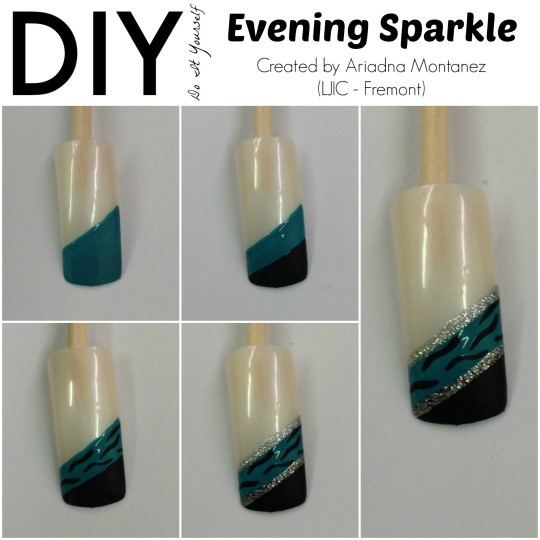 Today’s LJIC Tues-Torial was created by Ariadna Montanez(Cosmetology student at La’ James International College in Fremont). Step 1: Being by painting the nail red from the corner to the center. Next take your blue polish and paint the other half of the nail. Step 2: Use nail glue to attach a small white star embellishment. Step 3: Using a fine brush and white polish, draw strokes from the star down the nail. Step 4: Final step is to add a glitter of your choice. Ariadna used a gold glitter along top of the white strokes. Step 1: Apply a base coat and then 2 coats of your favorite color. Ariadna used a orange for this look. Step 2: Draw small slightly curved lines where you want your feathers to be. 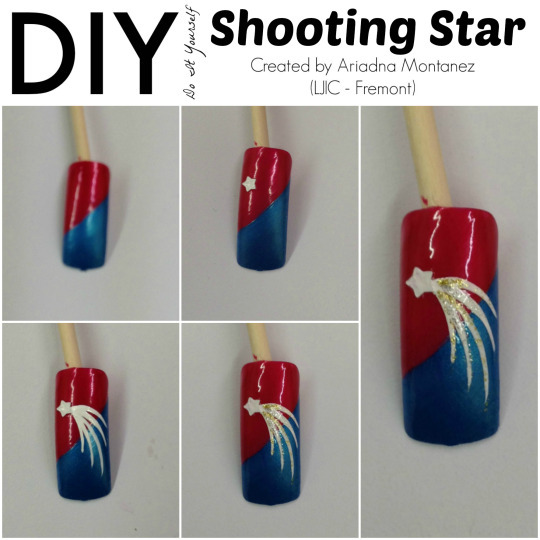 Ariadna chose to do 3 feathers. Step 3: Draw tiny little lines from the center of your previous stroke. The lines should get smaller the closer you get to the end of your feather. 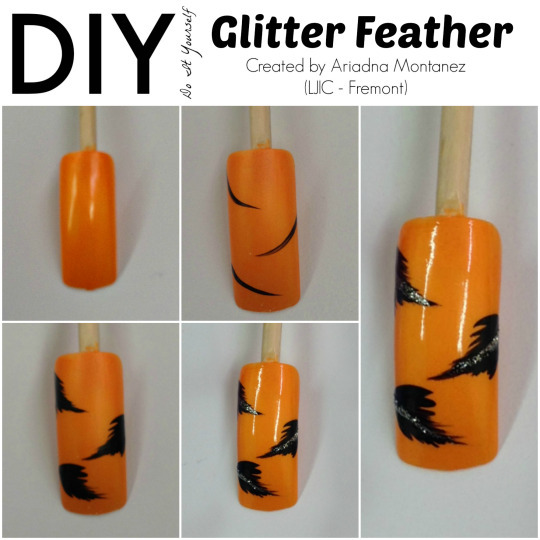 Step 4: Use a glitter polish to draw a line down the center of each feather. Then apply a top coat. Step 1: Polish the entire nail white. Then pick you favorite color and polish half the nail from the corner to the center. Step 2: Next take your black polish and paint a smaller section from the corner to the center on top of your previous color. Step 3: Using your black polish, create small dots or squiggle lines in the center. 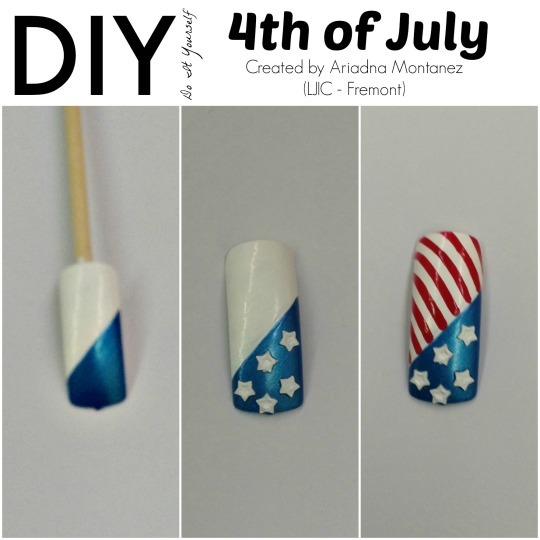 Step 4: Finish up the design by applying a glitter nail polish outlining where the colors meet. Step 1: Polish half the nail with a white polish from the corner to the center. Next apply a blue color on the other half. Step2: Use nail glue to attach small white star embellishments. Step 3: Finish this look by creating stripes with a red polish. Excellent job Ariadna and thank you for participating in this week’s LJIC Tues-Torial!